On the Triple Crown Trail, most top horses got this weekend off, what with just 2 races scheduled. Horses based at the Fair Grounds competed in the $600,000 Louisiana Derby, a Grade 2 event over 1 1/16 miles. A field of nine went to post, with High Limit sent off as the lukewarm 5-2 favorite, with Scipion the 7-2 second choice. High Limit winner of the Louisiana Derby. Jockey Ramon Dominguez gunned the favorite to the front right out of the gate and into the clubhouse turn, as John Velazquez took 21-1 longshot Vicarage in from the 8 post to stalk the pace to his outside. High Limit got the half in 47.36 and 3/4 in 1:11.85, with Vicarage always remaining within a length of the front. Turning for home, Dominguez asked High Limit for run and got it, as the favorite drew clear by 2 lengths at the 1/8 pole, survived a brief scare by jumping the tire tracks left by the starting gate a the 1/16 pole, and continued to draw off to win by 4 lengths in 1:42.74 over Vicarage, who held second the whole way around. 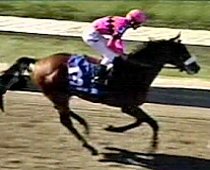 It was a long 3 3/4 lengths back to 5-1 fourth choice Storm Surge in third. Scipion was never in it, settling at the back of the pack and wide around both turns and having nothing left for the stretch run, finishing sixth. Winning trainer Bobby Frankel said, "He's a nice horse. The first time you run a horse, you never know how they are going to run. He seems to run for everybody. He's a good horse, hopefully this race didn't take too much out of him. Next up, probably the Wood or the Bluegrass; we'll have to see how he came out of this race." Winning rider Ramon Dominguez said, "I was very pleased. He finished very strong. He gave as much as you asked him to. The only other time I hit him was the second time out when he went two turns for the first time. I was not surprised by his performance. He seems to be a very good horse." Rafael Becerra trainer of El Camino Real Derby winner Uncle Denny. The second-stringers on the west coast converged on Bay Meadows for the $200,000 El Camino Real Derby, a Grade 3 event at 1 1/16 miles. Ten were entered, with Uncle Denny and Stellar Magic the co-favorites at just over 2-1. 59-1 longest shot Vasilias went to the front right away and set a blistering pace of 22.63 and 45.68 as Uncle Denny battled with him to his outside. Entering the second turn, Vasilias tired and dropped out of contention, allowing Uncle Denny to inherit the lead and get 3/4 in 1:09.96. Into the lane, Uncle Denny began to pull away, 2 1/2 lengths clear at the 1/8 pole, and he easily held off the late charge of 9-2 third choice Wannawinemall to win by 2 1/4 lengths in a time of 1:42.22. It was just a nose back to 8-1 shot Buzzards Bay in third. Stellar Magic settled back early but showed nothing late, finishing last. Winning rider Russell Baze said, "I knew we were going fast. But he was doing it all underneath me. I took a long cross and let him run and tried to get him to relax as much as I could. He didn't mind those other horses running up to him. He ran fast enough to keep his head in front. When I shook him up at the quarter (pole), he opened up, and he re-broke again after the wire." Winning jockey Rafael Becerra said, "I think he's the best horse I've had on my hands. We'll look around at where to run him next. We need to meet good ones to find out his potential." Becerra is considering either the Santa Anita Derby or the Wood Memorial. 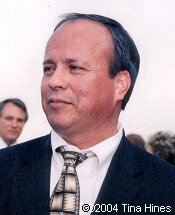 Becerra and owner Stan Fulton also raced 2004 contender St. Averil, who scratched out of the Derby with a foot injury. April 9 - Wood Memorial, Santa Anita Derby, Illinois Derby, and the Bay Shore Stakes.